I feel bad that I haven't been posting lot of authentic Rajasthani Recipes. So, to ease my guilt, here is one of the recipes of Rajasthan which are mainly eaten in winter months as this keeps your body warm and thus helps you fight the cold winters of desert area. Today, I am giving namkeen khichdi (savory version) of it and soon will post the sweeter version as well. Soak bajra in water for an hour and then air dry it (spread it on a cloth and let it air dry) for another hour or so. Then coarsely grind it and remove all the dust and hull from bajra. Take a cooker and add oil to it. Once it is hot, add jeera and heeng and let jeera splutter. Add cloves, cardamom, cinnamon and after 15 seconds, add green chilies and ginger till it is friend. Add peas and carrots and let them fry for 2 min. Add bajra, rice, moong dal, salt and water and close the lid. Switch off the heat and once the steam is all released, mix it well and serve. This is just served as is with a dollop of ghee on top. You can serve it some hot kadhi. I am sending this to my own MLLA # 30 which was started by Susan. I love this Priya...reminds me of home. Top it with load of home-made ghee, and yum! Healthy and yummy dish,awesome for this weather. 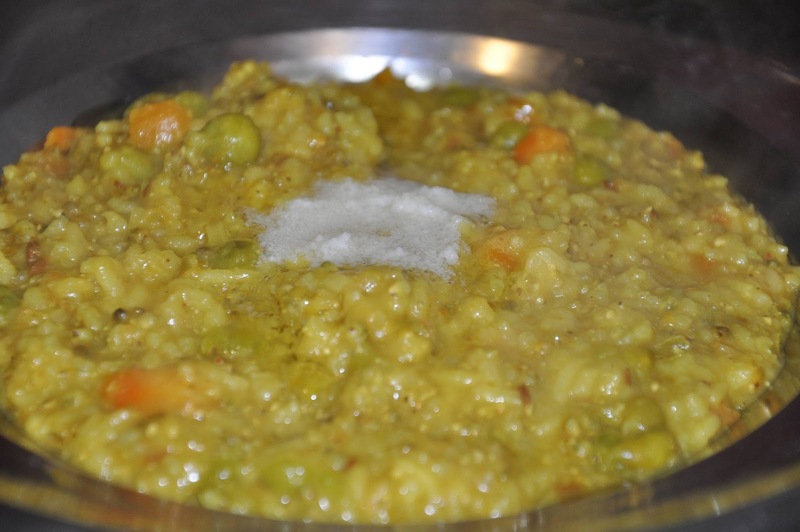 Millet-moong porridge looks super delicious.Bookmarked. Looks healthy and delicious Priya. i love khichdi and this one looks swell- ! very healthy and interesting..never cooked whole millet at home..so pbly need more input on how to take the hull and dust..
New to me,quite interesting. Yesterday got to watch 'Chak le re', a cooking show in NDTV Goodtimes and it was a Rasjasthani delight. Very very interesting combos and looked very delciious. Nice Click ! Loved this version of khichdi ..
Yum! Millet is so healthy and has such a nice taste! Your porridge looks delicious! Never heard of this recipe before. This looks not just tempting but healthy too. Looks delicious and healhty meal..
Definitely a healthy,nutritious at the same a filling porridge, delicious! Looks very delicious and a healthy porridge. that sounds like such a comfort food, love it. love it when u r at ur authentic best! the recipe is simply gr8!! Looks so delicious and yummy....sure is a comfort food!! excellent and healthy...i do make bajra roti..keeps warm in this winter..thnx for stopping by.. This is quite yummy Khichdi.I make the same with dalia! One of my neighbours brought this at a potluck. It was extremely tasty. Thanks for the recipe. Will try it soon. This looks like comfort food to me.I am going to book mark and see if i can get whole bajra at the indian grocery store. You forgot to mention rice in preparation section.